Dr. Huang’s research focuses in part on helping kids’ immune systems build the defenses necessary to attack cancer cells. Known as immunotherapy, this exciting new form of treatment is being explored in a few clinical trials that have already saved children’s lives. Dr. Huang’s research team at CWRU is also investigating new methods for halting the spread of osteosarcoma – the most common type of bone cancer in children – to major organs, like the lungs. It’s this spreading of the disease, known as metastasis, that can make it far more difficult to treat. Dr. Huang’s work is supported by a St. Baldrick’s Innovation Award as well as the Osteosarcoma Collaborative St. Baldrick’s Grant to Cure Osteosarcoma. The goal is to develop new treatments for osteosarcoma by targeting cancer molecules that evade the compromised immune systems of children diagnosed with the condition. Dr. Huang’s team is organizing several clinical trials designed to test a variety of osteosarcoma treatment options. According to Dr. Huang, it’s an important step in the fight against a disease that’s proven highly resistant to conventional treatments. “Despite tremendous progress being made in many pediatric cancers, outcome for metastatic osteosarcoma has really not improved over the last few decades even with gallant efforts in optimizing conventional chemotherapies,” Dr. Huang said. Even with his extensive funding from St. Baldrick’s, Dr. Huang recognizes that more money is required for childhood cancer research and he refuses to give up hope. That’s why he’s such a huge backer of St. Baldrick’s head-shaving events, which help pay for lifesaving research and clinical trials. In fact, each year he helps organize the event co-hosted by UH Rainbow Babies & Children’s Hospital and CWRU’s School of Medicine. Asked what motivates him to participate, other than his professional interest in pediatric oncology, Dr. Huang points to some painful encounters with cancer during his own childhood. Because he’s entering his 11th year as a St. Baldrick’s fundraiser, Dr. Huang has reached the rank of Knight Commander in the Foundation’s popular League of Legendary Heroes. The elite Knight Commander rank is reserved for individuals who’ve dedicated at least a decade worth of volunteer service to helping kids fight cancer. For Dr. Huang, it’s an honor to reach such a lofty position within the League. “I know first-hand the passion and effort of [St. Baldrick’s] grass root volunteers and donors, and I appreciate having you as partners in this most worthy cause of finding a cure for childhood and adolescent cancers,” Dr. Huang said. 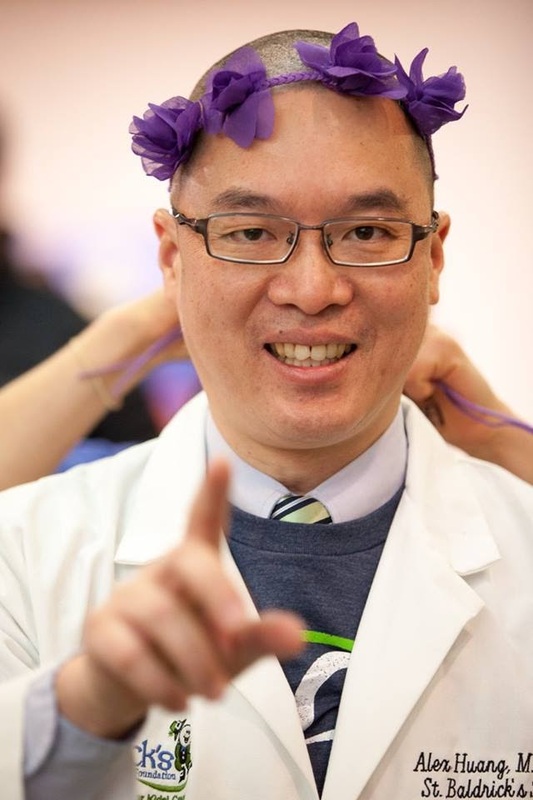 If you’d like to join Dr. Huang in shaving your head for kids’ cancer research – or if you’d like to volunteer in another way, such as by shaving the heads of others – check out our registration page. You can also organize your own fundraiser, like a head-shave or a Do What You Want event that could involve running, walking, cycling, or selling baked goods for a great cause: helping kids beat cancer. Questions? Feel free to reach out to us for more information.